Every little girl dreams of being a fairy princess, escaping boring old reality into a fantasy land where ever wish is granted, ever whim pampered to, and every dress trimmed with pink lace. And if ever there was a little girl in need of an escape route, it's Ofelia (Ivana Baquero). The year is 1944 and the setting war torn Spain, shortly after the victory of the fascist forces. Ofelia's mother, Carmen (Ariadna Gil), has just married Captain Vidal (Sergi López), a cold-hearted military leader who has dragged his new family deep into the heart of an ancient forest that's crawling with guerillas. and fairies. The brutality with which Vidal pursues the rebels is matched in intensity only by the callous way in which he treats his pregnant, seriously sick wife and sensitive stepdaughter - and by the menacing allure ofthe mysterious gothic labyrinth next door to the army's HQ, a macabre underground world to which lonely, highly strung Ofelia soon finds herself drawn. There she meets a magical faun (Hellboy's Doug Jones), who tells her that she is indeed the long lost daughter of an all powerful Fairy King, and must pass three gruelling tests before she can return to her homeland. But forget your cuddly Mr Tumnuses - this is no cute, hairy-legged beastie we're talking, but a toweringly tall, sinister, yellow-toothed monster that looks more like a creature form Nightbreed than Narnia. 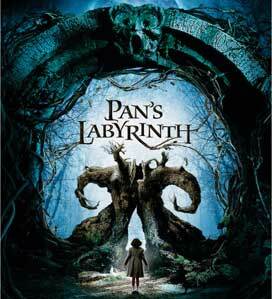 But, while Pan's Labyrinth is billed as a fairy tale for adults, the fantasy elements are never allowed to overwhelm the human plot of struggle and sacrifice in a terrifying and dangerous time. Instead, the two worlds reflect each other, the cruel, illogical tests which Ofelia must pass, thrilling and shocking as they are, serve also to highlight the senseless atrocities taking place in the real world, at the behest of Captain Vidal. For the real monster of the movie lurks not under the bed at the head of an army. The whole film has a strange, fairy tale logic to it, with characters seemingly acting not from choice but as if compelled, like the princess who marries a frog or the girl in the red shoes who must dance herself to death. We're not told what desperation led Carmen to marry the vile Vidal, nor what kind of awful upbringing made him into the monster he's become (although an anally retentive hero father is hinted at). Yet the harsh life lesson Ofelia must learn, both above ground and below, is that only by refusing to obey blindly the dictates of others and making our own moral choices can we ever truly be free - even if it means sacrificing everything in the process. What with scenes of torture and death in the real world and some truly nightmarish creatures haunting Ofelia's fantasy world (the Pale Man, in particularly, will keep you awake at night) Pan's Labyrinth is not for the faint hearted. Director Guillermo del Toro (Cronos, Hellboy) is a true gothic visionary, refracting fairy tale romance through a very dark glass. But, while the make up and special effects are simply superb, it's the brilliantly overwrought atmosphere and emotional punch that lie at the heart of the labyrinth and really serve to make this film special. A rite of passage movie with a monstrous sting in the tail, it's the perfect gothic fantasy, seamlessly blurring the boundaries between real and unreal, nightmare and dream, without every once appearing camp, quirky or stagy. It couldn't be further removed from Sunday 5pm BBC serials if it was on Mars. 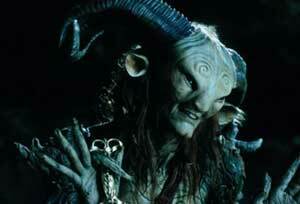 Beautiful, cruel and haunting, Pan's Labyrinth will leave you saddened, shocked yet touched to the core. So get lost in the Labyrinth - you won't regret the experience.